Preschool graduation is one of the biggest events of the year for students and their families, and it’s important to give your kids a special event that they will remember. But all that pomp and circumstance doesn’t come cheap. How do you do it when money is tight and your budget just isn’t big enough? 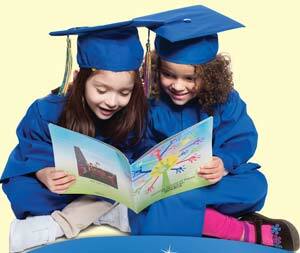 These easy fundraising ideas can help you give your kids an amazing graduation. Parents love to support their children’s schools, but schedules often make it difficult for them to contribute. 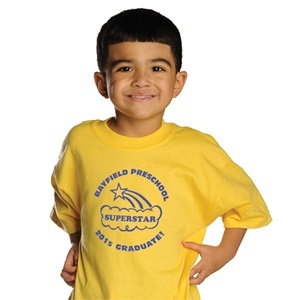 Selling custom-imprinted items that feature your school or center’s logo offers parents a great way for parents to show their support and your school an easy way to raise funds for graduation. Try adding your logo or special artwork to things like t-shirts, water bottles, bumper stickers, and even cell-phone chargers. Most businesses love to help out their local schools whenever they can. Recruit parent or staff volunteers to call or visit businesses in the community and ask for monetary donations in exchange for free advertising. You could offer ad space in your graduation program, print their logo on a special “Sponsors” banner, or even mention them in a special announcement during the ceremony. A school-wide garage or yard sale is a great way to reuse and recycle items among families and to raise money for your center in the process. Ask parents to bring unwanted and/or gently used clothing, toys, books, DVDs and more that they would like to donate. Arrange items by category and price them fairly. Have staff and parent volunteers handle things like organization and money collection, and invite families to come and shop for new (or new to them) things. Local businesses that can’t contribute financially might be willing to donate products or services that you can use as part of a silent auction to raise money for graduation. Ask a few parents or volunteers to organize the event, and invite the entire community. Host an art show at your center that showcases art your kids have been working on all year long. Let each child choose a special piece to frame, and display the other pieces all around the room. Charge a small admission fee, provide refreshments, and let parents take their children’s artwork home at the end of the event. To maximize your profits, have some of the artwork printed on mugs, T-shirts, and hats that you can sell as fun mementos. Trike or Bike-a-thons are becoming popular ways for schools and centers to raise money. Create a track around your school, in the gym, or in a safe area of the parking lot and have kids collect pledges for a certain amount of money per lap around the track, per time increment, or a flat amount. Invite young kids to participate on their tricycles or big wheels, let older siblings bring their bicycles, and of course, invite parents to come and cheer their children on. Everyone will have tons of fun, and it won’t even feel like a school fundraising event. This is one of the easiest ways to fundraise for your Preschool graduation. Place a large jar near the door of your center and put up a sign asking parents to contribute their extra change every time they drop off or pick up their kids. Make it clear that the money will go toward creating a memorable graduation event. To up the stakes a bit, and make it more fun, put a jar in each classroom and have a contest to see which class can raise the most funds. This is a great fundraising idea that does double-duty: It gets families and the community involved in your school AND raises funds for your graduation event. Charge a small fee for carnival tickets and/or BINGO cards, sell concessions, and pick up small prizes at your local dollar store. A yearbook fundraiser takes a bit of planning, as you will need to take pictures all year long, so start snapping pics right from the very first day of school. If you want to include pictures of the graduation ceremony, order your yearbooks after graduation. Another option is to order them beforehand and leave a blank page where parents can attach their own graduation photos. Either way, parents will love to purchase yearbooks as special mementos of the big day. With these easy budget-boosters, you can give your kids and their parents a special and memorable Preschool graduation ceremony. How do you raise money for graduation and other events at your center? Share with us.